Wear your Westie with pride! Looking for replacement brass knobs for your Thunder? Some Forum members have made their own but not all of us are able to use a metal lathe. The good folks at Armadillo Guitars have made some nice repro’s available at a reasonable price. If you’re a stickler for original detail you should be warned that the knurling on these is coarser. Still, they make a nice replacement in all other respects. This string-through-rear style brass bridge assembly was made to order for one of our forum members, spidey2, in May of 2011. It’s a more reliable replacement for the poor “barrel saddle” design found on many early 1980’s Westone Thunder and some Vantage Avenger models. As of this writing the company hasn’t listed the item on their web site but we understand that it soon will be, particularly the saddles. All items are made from Alloy 360 brass. If interested, contact them for prices and delivery. Prefer the Real Thing Instead? The Japanese company who made the original bridge is still in business, and they still make this bridge! Read about the Gotoh GTC101 bridge HERE. 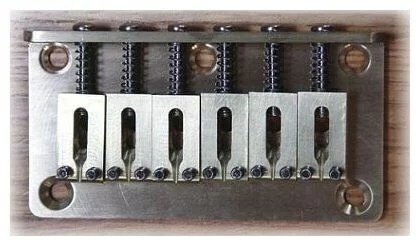 Looking for a Bendmaster FT Tremolo Bridge Replacement?